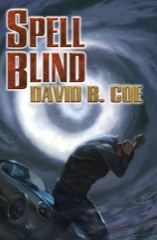 As I mentioned last week or so, I read David Coe’s Spell Blind. I really enjoyed it. It’s a murder mystery/police procedural/noir/fantasy novel with great characters and well-developed relationships. I can’t wait to see how they play out. There’s Justis’ old partner, his dad, his enemy from the police force, his informants, and many others. So much richness and a cool magic system. I want to blather on more, but I don’t want to offer spoilers. Suffice it to say, this is a really great book, and one that you should read. Buy it now. 1. Why don’t you start by telling us a little about SPELL BLIND and the Case Files of Justis Fearsson? Sure. This is a contemporary urban fantasy set in modern day Phoenix, Arizona. My lead character, Justis “Jay” Fearsson, is a weremyste, which means that he is a conjurer, a wizard, a mage — whatever you want to want to call him. But every month, on the night of the full moon, and the nights immediately before and after, he loses control of his mind and his magic. His hold on reality weakens, but his power strengthens. And over the long run, these phasings, as they’re called, are going to drive him permanently insane, just like they did his father, who is also a weremyste. Jay used to be a cop, but the phasings cost him his job and so now he’s a private detective. And as the book begins, he is drawn back into the investigation of a serial murder that haunted him during his time on the force. 2. This book is quite different in some ways than previous books you’ve written (though clearly you’ve done mystery with your fabulous Thieftaker books). Talk about how and why you came to write this book. I first started working on the Justis Fearsson series nearly a decade ago, after finishing the last book in Winds of the Forelands, a five book epic fantasy series that had consumed me for years. (Before that I write the LonTobyn trilogy — also epic fantasy.) As I began the Fearsson book (in a form that bears little resemblance to the finished product) I also started writing Blood of the Southlands, an epic fantasy trilogy. And so I was looking to do just what you say: I wanted to write something that was as different from my older work as it could be. I wanted to write mystery, I wanted to have modern characters who could speak and act and curse like people do in our modern world. I wanted them to drive cars, because I was sick to death of writing about horses. I wanted them to go to malls and movies and night clubs, because I’d had enough of castles. And, most important, I had an idea for a character whose access to magic was slowly driving him insane, which is the central premise of this new series. Setting it in our world seemed like the natural thing to do, not only because it would be something new to write after all those epic fantasies, but because the power of his descents into madness would be amplified by having him deal with the mundane things that we take for granted in our everyday lives. As to how, I wrote the book, that’s a more convoluted story. This book has been through so many rewrites it’s not even funny. I have changed the main plot, the magic system, the pacing — everything. Or rather, everything except the characters, who I love. It was my love of them and their interactions that kept me working on this manuscript long after any sane writer would have given up. But I finally got it right, and I really love the finished product. 3. One of the toughest things I find about writing a mystery is keeping the book moving while still maintaining the suspense. You did a really great job of capturing the procedural, developing characters, and pacing the mystery. What sort of difficulties did you run into writing the mystery and how did you solve them? Well, as I say, I went through many, many rewrites on this book. So I certainly didn’t get it right at first. Thanks, though, for the kind words. I think the toughest thing for me was pacing the action. Early incarnations of the novel really dragged in the first quarter. I wanted to build the action gradually, to ratchet up the tension. I realized though, with the help of beta readers, that I was holding back too much in those early pages. In the end, I found that the best way to overcome the slowness of those early pages, while also not giving away too much too soon, was to introduce my magic system in the opening chapters. And when I say introduce the magic, I don’t mean explain it. Rather, I wanted to show my reader the magic through early conflicts and action scenes, and through my protagonist’s interactions with his magical mentor, who is a really cool character. Magic lies at the heart not only of the plot, but also of the mystery and the motivations of the big bad. And so using the magic in this way was not at all a distraction. Quite the opposite; it set up the later revelations that are so central to the novel’s ending. And, as I say, I took care of those early pacing issues. 4. You mention in the acknowledgements that you consulted with members of the police and ME departments in Phoenix to get the details right. What did you learn that surprised you? — Police headquarters in Phoenix is called “620” because it sits at 620 West Washington Street in downtown Phoenix. — Detectives used to have their own offices, but cutbacks at the department forced them into cubicles. And since their work spaces were no longer secure, many of them had to go out and buy those fireproof safes that they sell at Target so that they would have a place to store sensitive documents. — And so many other little tidbits about sign-in procedures at the ME’s office and the appearance of the various body storage facilities. I could have faked this stuff, or not included those details, and most people wouldn’t have noticed. But small details like that are the bread and butter of a writer. They lend a sense of realism, of verisimilitude to what we do. Without them, our books are more bland, and less convincing. With them, our stories come to life. That’s what I got from those conversations with the generous professionals at the Phoenix police and ME departments. 5. Where is the next book going, if you can do that without spoilers. I have to admit, I want to see Justis work with his dad. When will we be able to find it on the shelves? The second book in the Case Files of Justis Fearsson is called HIS FATHER’S EYES, so you’re going to get your wish. Justis’s father, who, as I said before, is also a weremyste, and who has largely lost his mind at this point, is being tormented by dark sorcerers for reasons Jay can’t figure out. And so Jay has to help him, and eventually work with him, in order to solve the mystery. This next volume also features a billionaire financier with ties to dark magic, a ruthless drug kingpin, were-creatures, a terrorist attack, and the murder of a powerful runemyste. I really love this book and am pleased to say that it will be out on August 4. Di again: As I said, I loved this book, and I can’t wait for the next. I really wanted more on Justis’ dad, so I’m over the moon. This is a link to David’s website, and has a link to a sample chapter from the book. This entry was posted on Wednesday, March 11th, 2015 at 3:00 pm in writers who are not me. Tagged: David Coe, Reading. You can feed this entry. Both comments and pings are currently closed.